There's nothing quite like homemade cherry pie. Serve with a big scoop of vanilla ice cream. For the pie filling, heat the cherry jam and water in a pan over a low heat, stirring continuously, until the jam has melted and is starting to bubble. Add the arrowroot mixture and stir to combine. Continue to simmer the mixture until the sauce is very thick and smooth. Add the cherries and stir carefully to coat them in the hot jam mixture. Transfer the filling mixture to a 1 litre/1¾ pint pie dish (they should reach just above the rim of the dish). Set aside to cool. For the pastry, pulse the flour, butter and sugar together in a food processor until the mixture resembles fine breadcrumbs. Mix together the beaten egg and water. Set aside one tablespoon of this mixture to use as a glaze. With the motor still running, gradually add the remaining egg and water mixture to the bowl of the food processor a little at a time, until the mixture comes together as a dough. Roll out the pastry onto a lightly floured work surface until it is 7cm/2¾in larger in diameter than the pie dish. Cut two or three long strips from the edges of the pastry (2.5cm/1in wide). Brush the rim of the pie dish with a little of the reserved beaten egg. Lay the strips of pastry onto the rim of the pie dish, overlapping the strips slightly at the joins. (This will make a thicker edge for crimping.) Brush the pastry rim with more of the beaten egg. Gently lift the rolled pastry, using the rolling pin, and place on top of the cherry filling. Press the pastry down at the edges to seal the layers of pastry together. Trim off any excess pastry, then crimp the edges with your fingertips. 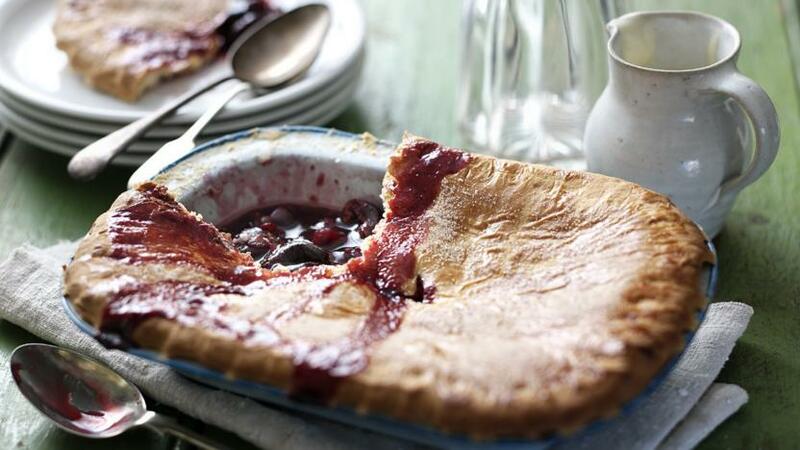 Transfer the pie dish to a baking tray and chill in the fridge for 30 minutes. When the pie has chilled, brush the pastry lid with the remaining beaten egg and sprinkle over the remaining two teaspoons of sugar. Using a sharp knife, cut a small cross in the centre of the pie lid. Bake the pie in the oven for 25-30 minutes, then reduce the oven temperature to 180C/350F/Gas 4 and continue to cook for a further 15-20 minutes, or until the pastry is golden-brown and the pie filling is bubbling.